Vermont Creamery’s American line of French-style ripened goat cheese isn’t complete without this petit surfaced ripened crottin. Bijou, meaning “jewel” in French, has a citrusy flavor and a geotrichum rind that encourages a unique sweet and yeasty flavor. 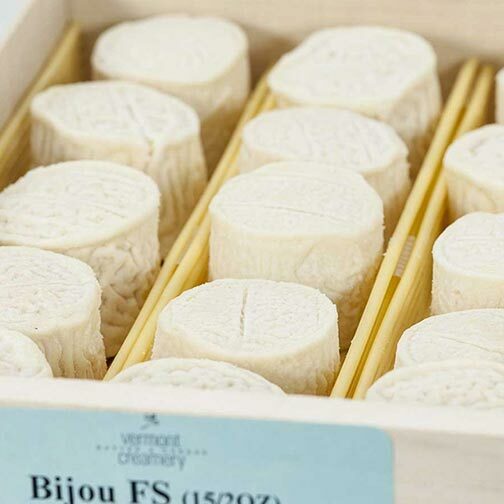 Made with fresh pasteurized goats’ milk from Vermont family farms, Bijou’s curd coagulates overnight, drains in cheesecloth before being shaped into little buttons, dried and ripened for one week. Simple and fresh. Bijou develops over time, gaining a sharp complexity after 30 days.